Acoustic Wallpaper is an excellent way of addressing internal noise and reverberation as it can cover a large surface area within the room and is and it’s also easy to install making it an attractive, affordable solution. 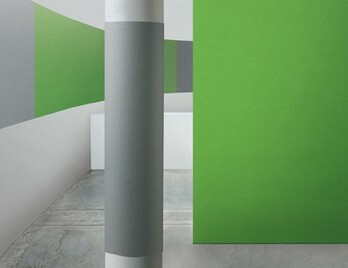 Ordinary wall paper itself does have acoustic properties as it helps dampen sounds and noise levels but is obviously not a complete soundproof solution. Acoustic wallpaper helps dampen sound further because it’s made up of layers, with the top layer being made of a soft material such as felt or polyester. This is a great way of brightening up your office or home as the felt or polyester is available in many different patterns and textures and can be combined to create striking contrasting colours. Acoustic wallpaper can also be suitable for tacking drawing pins for notes and memos making them an ideal solution for student accommodation or a home office study whilst absorbing noise levels within the working space or area. Acoustic wallpaper does not therefore need to be restricted to commercial or working environments as can add visual interest to a lounge, bedroom or kitchen whilst also being a suitable acoustic solution to noisy rooms such as laundry room, garages or workshops. The soft feel of the felt on the wall certainly emits a homely feeling and with personal notes and photos pinned to the surface completely transforms a plain wall in to something of real interest and value. Acoustic wall paper can also feature printed graphics and images which can enhance and give a unique feel to your interior space such as concrete for an urban, industrial theme or plants and jungle for a natural theme. This can help set a tone for a certain area within your working environment whilst also enhancing room acoustics. 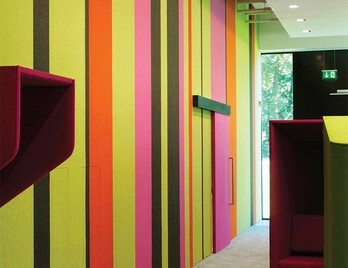 If you looking for a fun way to enhance your working environment whilst also improving the acoustic soundscapes acoustic wall paper could be the solution you are looking for.